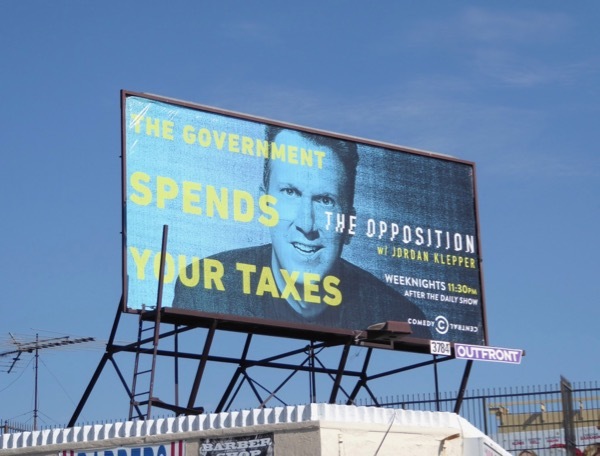 At certain times of year in Los Angeles there just seem to be too many billboards filling the sprawling city skyline to keep up with, so after gracing the streets and skies for the past few weeks here are a fun selection of billboards for The Opposition with Jordan Klepper. 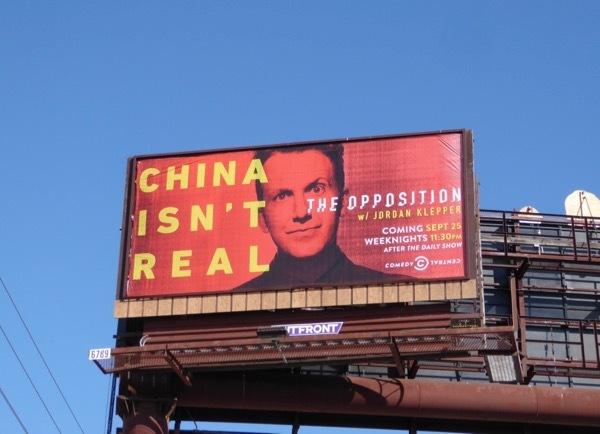 In his new Comedy Central series the comedian supplies us with a faux right wing response to the Resistance to Trump's disastrous presidency, poking fun at all the conspiracy theorists and anti-establishment pundits. 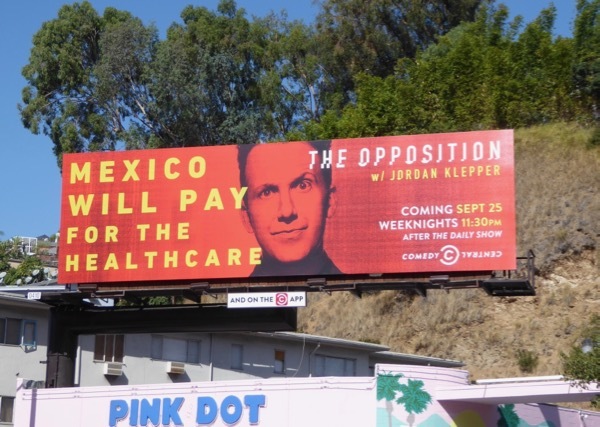 You can just imagine 45 or one of his propaganda mouthpieces spouting something like "Mexico will pay for healthcare" or "The government spends your taxes", "There's hydrogen in the water" (that's a scientific fact) or "China isn't real". 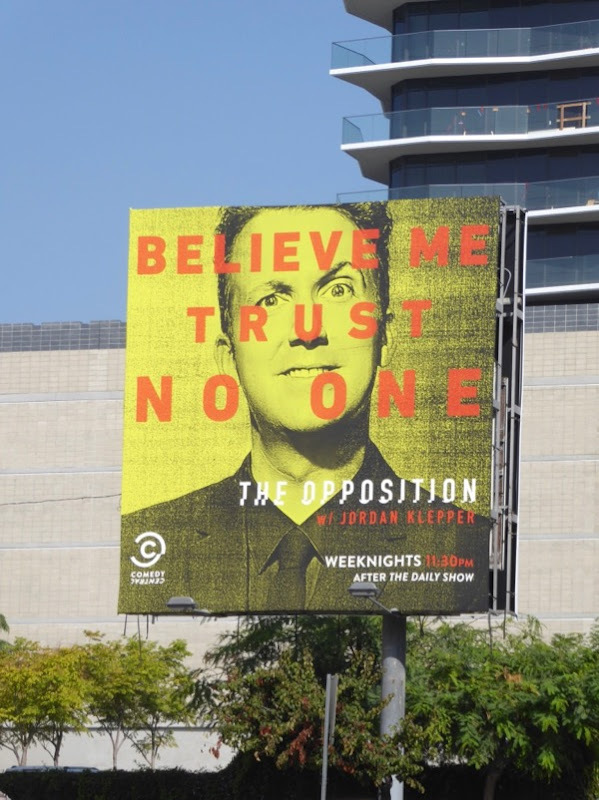 In fact Trump has said some real corkers already, like saying that climate change is a Chinese hoax (scientists around the world and in America say no), that Mexico will pay for the wall (they have stated they won't), that Russia didn't meddle in the latest election (they did), that any negative polls are fake news and that the problems with mass shootings isn't guns but mental health (obviously that's why he revoked Obama's gun checks for people with mental illness). 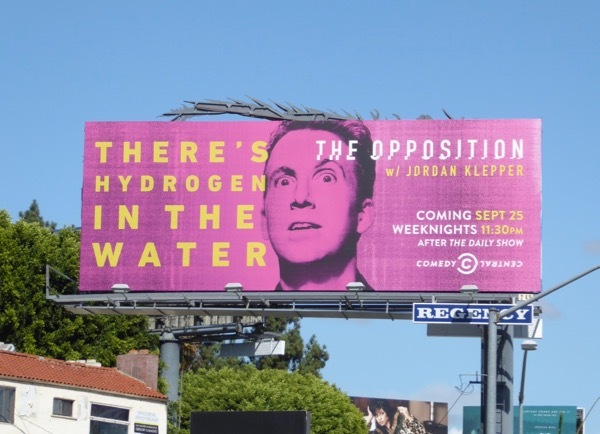 With source material like this, the jokes and parody comes easily. 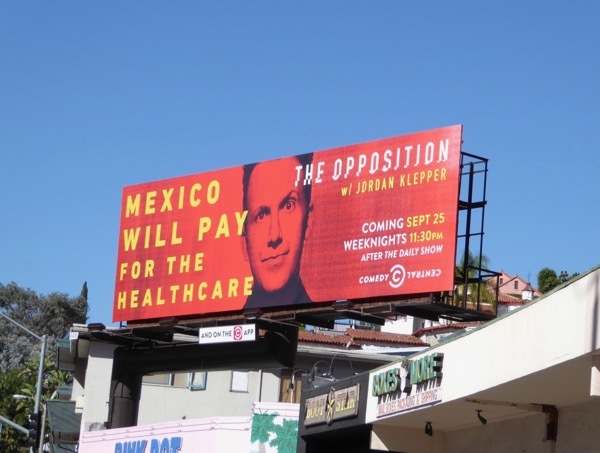 These colourful, clever billboards for The Opposition were photographed along the Sunset Strip, Pico Boulevard, Santa Monica Boulevard and Argyle Avenue from September 22 to November 4, 2017. 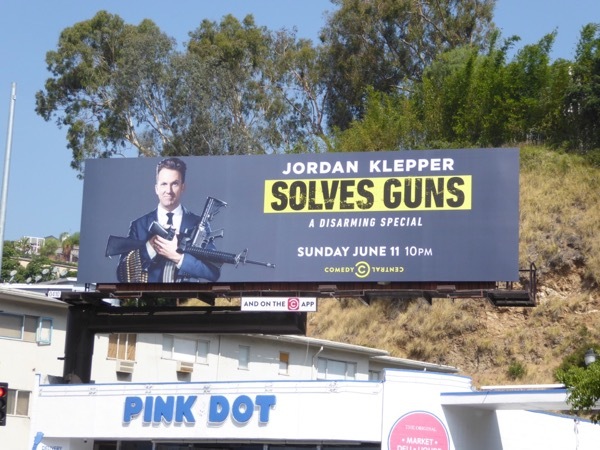 Meanwhile, as a bonus here's also a billboard for Jordan Klepper's Solves Guns comedy special snapped along the Sunset Strip on June 2, 2017. 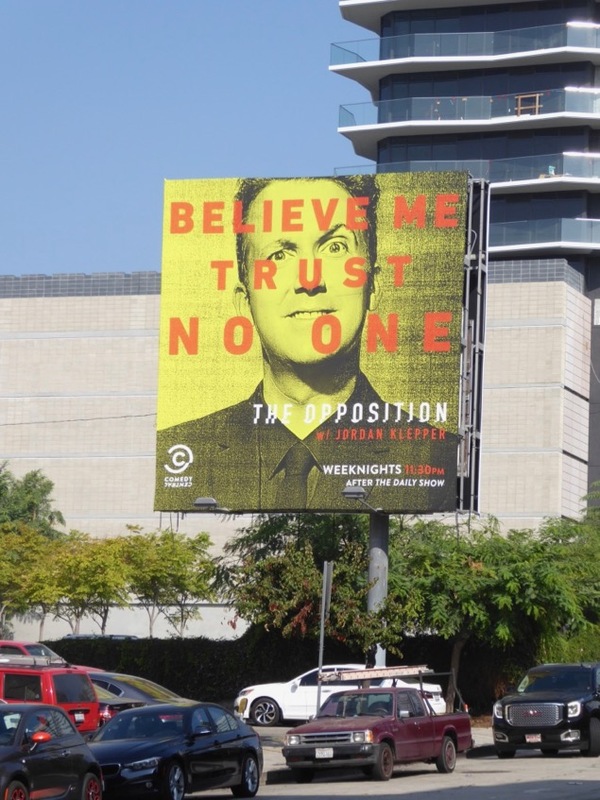 For more reactions to Trump's nightmare vision of America, make sure you also check out these billboards for George Lopez's The Wall stand-up special, Stephen Colbert's Emmy consideration billboard for The Late Show and these Full Frontal with Samantha Bee billboards. With Democrats enjoying some stellar election results this November, with significant wins for women and diversity, you can see that the United States isn't just made up of white supremacists, homophobes, misogynists and rich people wanting to get richer at the expense of others. 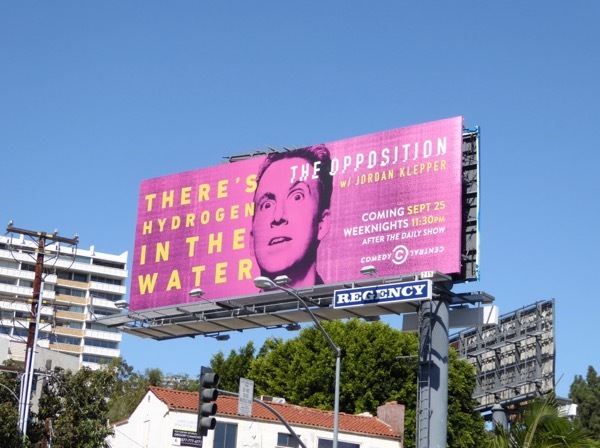 Keep fighting the good fight America, resistance is not futile.